Regulatory Framework Governs Demand for On-Site Hydrogen Generators in the U.S. The vast reserves of natural gas and its availability in absolute abundance is expected to boost the adoption of on-site hydrogen generators across the U.S. region. Transparency Market Research observes, several end-users industries are demanding on-site hydrogen as they provide a cost-efficient option along with safety and security by making the operations free of hydrogen storage, cylinder handling, and routine hydrogen delivery. With this strong backing, the opportunity in the U.S. on-site hydrogen generator market is expected to be US$153.32 mn by 2023 from US$99.78 mn in 2014, surging at a steady pace of 5.0% between 2015 and 2023. The on-site hydrogen generators based on non-alkaline technology held a leading share of 67% in the overall market in 2014. The non-alkaline technology will continue to lead the market with a CAGR of 4.7% in the forecast period. This technology will garner bigger revenues due to the technology it uses, which is able to deliver reliable, portable, purer, and cost-effective hydrogen production. The on-site hydrogen generators that have a flow rate of <100Nm3/h are leading the market due to their remarkable efficiency and compactness. These generators are competing with generators that have a flow rate of 100-2,000Nm3/h. In the near future, hydrogen generators that have a range of 100-2,000Nm3/h will emerge as leading generators due to their increasing adoption in various industrial verticals. The stringent environmental regulatory framework that is aimed at reducing carbon footprint is expected to boost the demand for hydrogen in making petrochemicals, fertilizers, and as an important energy carrier. The demand for hydrogen will also be felt amongst the specialty chemical manufacturers and refiners for meeting the production levels of cleaner products. All of these factors are expected to propel the installations of on-site hydrogen generators across the U.S. The rise of the on-site hydrogen generator market in the U.S. will also be driven by the need for reducing the dependency on conventional sources of energy and adopting cleaner fuel sources. The decreasing quality of crude oil will also be responsible for the emergence of this market in the near future. The increasing usage of hydrogen in various industrial applications will also provide a massive boost to the overall market. The non-alkaline on-site hydrogen generators are known to use steam reforming technology and proton exchange membrane (PEM) electrolysis. These generators are especially being preferred for applications such as reducing gas chromatography, metals, and annealing as they need pure hydrogen, which is achievable through PEM electrolysis. Some of the important players operating in the U.S. on-site hydrogen generator market are Praxair Technology, Inc., Nuvera Fuel Cells, Inc., Air Liquide, Air Products and Chemicals, Inc., Hy9 Corporation, Proton OnSite, Inc., Hydrogenics, and Linde AG. The competition in the overall market in quite cutthroat due to the existence of just a few players. In the coming years, companies will try to enter new markets with strategic alliances to meet the hydrogen needs of the remote areas. Furthermore, the trajectory of this market will also be decided by the strategies adopted by these players such as optimum usage of resources and production capacity. This research study analyzes the market for on-site hydrogen generator in terms of revenue (US$ Mn). The on-site hydrogen generator market has been segmented on the basis of category and flow rate. For the research, 2014 has been taken as the base year, while all forecasts have been given for the period from 2015 to 2023. Market data for both the segments including category and flow rate has been provided for the U.S. from 2014 to 2023. The report provides a broad competitive analysis of companies engaged in the on-site hydrogen generator business. The report also includes the key market dynamics such as drivers, restraints, and opportunities affecting the U.S. on-site hydrogen generator market. These market dynamics were analyzed in detail and are illustrated in the report with the help of supporting graphs and tables. The report also provides a comprehensive analysis of the U.S. on-site hydrogen generator market with the help of Porter’s Five Forces model. This analysis helps in understanding the five major forces that affect the market structure and market profitability. The forces analyzed are bargaining power of buyers, bargaining power of suppliers, threat of new entrants, threat of substitutes, and degree of competition. The high-level analysis in the report provides detailed insights into the on-site hydrogen generator business in the U.S. There are currently numerous drivers of the market. Some of the most prominent drivers are availability of low-cost natural gas feedstock and higher hydrogen purity percentage. Market attractiveness analysis was carried out for the on-site hydrogen generator market on the basis of states in the U.S. Market attractiveness was estimated on the basis of common parameters that directly impact the on-site hydrogen generator market in the U.S.
Increasing demand for energy and rising cost of fossil fuels is likely to propel the demand for on-site hydrogen generator in the U.S. Rise in application of hydrogen generator is anticipated to drive growth in the U.S. hydrogen generator market. The methods of hydrogen generation include steam forming of methane and natural gas. Low prices of natural gas and ease of availability are expected to augment the U.S. hydrogen generator market. On-site generation of hydrogen is likely to eliminate or reduce problems associated with transportation and delivery of hydrogen. Furthermore, on-site generation also lowers the cost of hydrogen generation as against merchant generation. Merchant generation of hydrogen utilizes hydrogen delivery modes such as trailers, cylinders, and pipelines. Pipeline transportation is feasible only if large quantities of hydrogen are to be transferred. Pipelines require higher initial investment as compared to other modes of delivery. Cylinder mode of transportation is preferred for small quantities. The extensive application of cylinders for hydrogen transportation is in various industries such as electronics, food processing, metal production and fabrication, and glass manufacturing. With the increasing number of refineries and petrochemical complexes coming up in the U.S., the on-site hydrogen generator market is likely to pick up in the future. Large populations in the U.S. also significantly boost the demand for hydrogen in ammonia production capacities, further increasing the demand for on-site hydrogen generators. 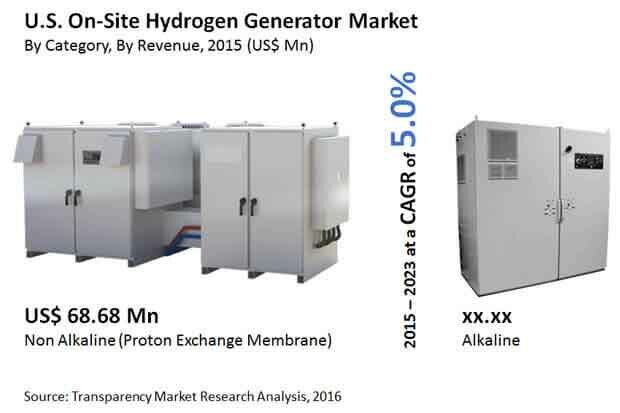 The on-site hydrogen generator market was segmented on the basis of category [alkaline and non-alkaline (proton exchange membrane)] and by flow rate (<100 Nm3/h, 100-2,000 Nm3/h, and >2,000 Nm3/h). The on-site hydrogen generator market was analyzed across the U.S. market. Key players in the on-site hydrogen generator market include Air Liquide, Air Products and Chemicals, Inc., Praxair Technology, Inc., Proton OnSite, Inc., Hy9 Corporation, Hydrogenics, Nuvera Fuel Cells, Inc., and Linde AG. The report provides an overview of these companies, followed by their financial details, business strategies, and recent developments.